The Gary Douglas Band has unveiled a powerful new lyric video heralding their hugely anticipated new album, DEEP IN THE WATER. “Nothing Ever Goes As Planned” is streaming now at the official Gary Douglas YouTube channel. DEEP IN THE WATER is also available now on all digital stores and streaming platforms. Gary Douglas has long been waging battle with the forces of greed and injustice, both as rebel rocker and as a Trial Lawyer Hall of Fame attorney who spends each and every day fighting for workers rights and the victims of corporate greed. The “Nothing Ever Goes As Planned” lyric visual touches upon Douglas’ unstinting belief that people have the power, weaving striking footage of recent protests and political rallies with an optimistic – but by no means rose-colored – view that still holds the American ideal as a promised land of equality, compassion, and opportunity. Indeed, “Nothing Ever Goes As Planned” also reflects Douglas’ recent legal efforts on behalf of multiple plaintiffs battling DuPont for injuries sustained by the chemical giant’s illegal dumping of the dangerous chemical C8 into the Ohio River – a landmark lawsuit soon to be dramatized in a new film from award-winning director Todd Haynes (I’m Not There, Carol). Douglas spearheaded the milestone litigation, representing the unsuspecting communities along the Ohio River Valley to whom DuPont referred in internal documents to as “‘human receptors.”‘ Much like the recent ruling against Monsanto in California, Douglas won a series of record-shattering settlements in the multi-district litigation, earning more than $700 million in punitive damages after juries agreed DuPont had acted with a “‘conscious disregard”‘ for the health and well-being of the families living along the river in Ohio and West Virginia. One of American music’s most urgent and uplifting live outfits, known for sold out headline dates and tours supporting such artists as Southside Johnny and the Asbury Jukes, Paul Thorn, and John Eddie, the Gary Douglas Band has slated a number of upcoming live dates surrounding the release of DEEP IN THE WATER. First up, the New York City-based band will rock their hometown with an intimate showcase performance at NYC’s Rockwood Music Hall – Stage 2, slated for Saturday, October 20th at 7 pm. The Gary Douglas Band will then team with Cowboy Mouth for a pair of eagerly awaited double bills at Pensacola, FL’s Vinyl Music Hall, set for Friday, October 26th (TICKETS) and Rocky Mount, VA’s Harvester Performance Center on Friday, November 2nd (TICKETS). Additional dates will be announced soon. Along with landmark legal victories against such monolithic foes as Big Pharma and the tobacco industry, Douglas – who was inducted into the Trial Lawyer Hall of Fame earlier this year, joining such legal giants as Thurgood Marshall, Morris Dees, and William Kuntsler – has somehow found equal time to lead his Gary Douglas Band for more than four years, lighting it up night after night with blazing guitars, anthemic hooks, and a potent lyricism that rings out with its craft, confidence, and striking conviction. 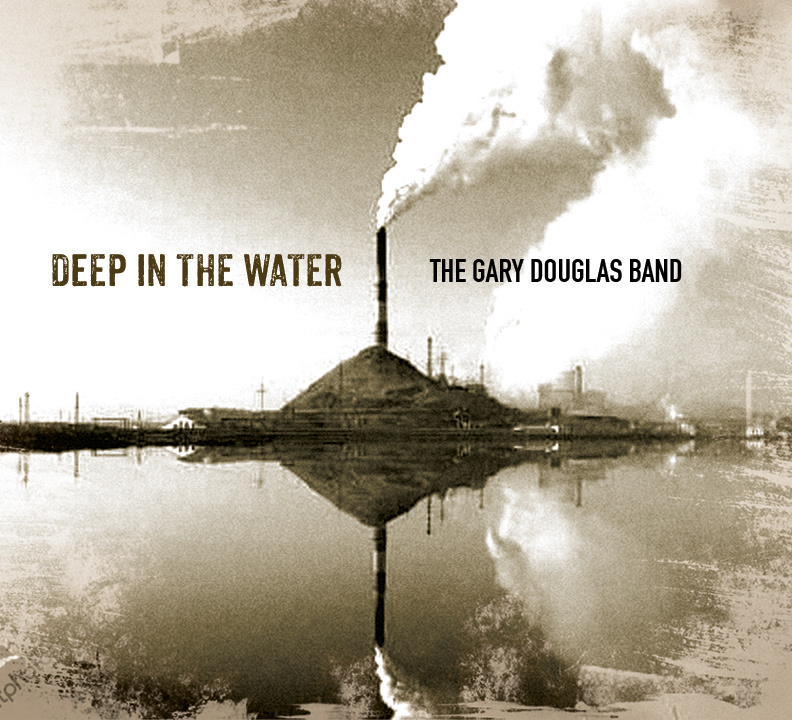 DEEP IN THE WATER fully catapults The Gary Douglas Band to the forefront of Americana and heartland rock ‘n’ roll, its powerful themes and searing truths perhaps more relevant now than ever before. Produced and mixed by Niko Bolas (Neil Young, Warren Zevon) and co-produced by chart-topping songwriter/producer Darrell Brown (Keith Urban, Radney Foster), DEEP IN THE WATER sees the Brooklyn-born singer-songwriter backed by an all-star lineup of friends and fans that includes Southside Johnny and his Asbury Jukes keyboardist Jeff Kazee, The Mavericks’ Raul Malo and Paul Deakin, The Jayhawks’ Jennifer Gunderman, guitarist Josh Leo, saxophonist Nicholas Biello, and a host of Nashville’s finest session players. Songs such as “‘Nothing Ever Goes As Planned”‘ and “‘Devil In Her Soul”‘ reflect the deep rift in the very fabric of our society, a division and dysfunction that threatens to tear us apart without some unifying rallying cry to bring us together. On March 23, 2018, dance pop sensation Ashley J released her debut EP, Satisfied. On the EP, Ashley combines her hit singles with unheard releases that she’s sure her fans will love. Ashley’s vocals swirl amidst innovative hooks and slick dance beats. Satisfied is fresh, modern, addictive, and meant to be devoured in one sitting – but it will stick in your head for the rest of the day. Ashley’s talents for songwriting shine on Satisfied. She’s come a long way since the days of writing lyrics on her parents’ bathroom walls. In those days, the words would be painted over. Now, they linger in your mind. They’re thoughtful, resonant, and get stuck in your head just as much as the earworm hooks. From the triumphant “Unbreakable,” in which Ashley finds the courage to pursue her inner strength following heartbreak, to the soaring love song, “Satisfied” – the EP covers a vast array of human emotions. It’s mostly explosive, but when Ashley wants you to feel something quietly, just for a moment, she draws you in – then drops the beat. Satisfied is almost constant energy, filled with dance anthems, and its premiere track in particular, “Trapped,” enjoyed four consecutive weeks at #1 on the European Independent Music Charts. Previous releases made it on the Billboard Top 10 Dance Charts, and given the sheer triumph that is Satisfied, a similar destiny awaits this new music from Ashley J, the Orlando native who started her own production company, then steadily conquered the world. The five-track Satisfied starts with the already massively successful “Trapped,” and also includes “Unbreakable,” “Satisfied,” “Like You Used To,” and “When I Come Home To You.” Though the songs may differ in the level of party they bring (particularly the bookend tracks), throughout the entire EP, Ashley J’s powerhouse voice dazzles. She is a true talent, from the pen to the page, to her voice in the studio. Three-time Billboard charting artist Ashley J has a fascinatingly diverse background: artistically and musically. She packs a wallop of a voice that fuses an infectious blend of vocal dexterity, moods and range. Ashley tempers her vocal prowess with poignant lyrics and a kindred soul as an emerging songwriter/singer. And it’s all aptly and full exposed on her new pop EP, Satisfied, released through her own production company imprint, Bombshell Music, Inc. The EP features five tracks self-penned by the emergent Ashley J, in collaboration with many established producers, including Lucas & Adrian Rezza, Jamie Sellers, and Warwick Matthews. Multiple singles off the EP have topped the European Independent Music Charts, particularly “Trapped,” which nabbed #1 for four weeks in a row. Her remixed singles of “One and One,” “Cali” and “Dare Ya” each made it to Billboard’s Top 10 Dance Charts in 2014 – 2016. The jubilant pop queen enjoys broad global appeal, with many drawn to her stellar, buoyant music. Step by step, Ashley continues her journey to become a revered figure in the world of pop music. (Los Angeles, CA) 2/7/18 – Southern California based and female-led rock group Dynamos are set to release their latest single “Knowledge” to online retail outlets worldwide on Feb 23, 2018. The moody, driving song will also be accompanied by a performance music video with all audio tracked live. This video (and its alternate audio of “Knowledge”) will be released on February 16th – one week in advance of the studio version’s release. The opening bass, guitar, and drums of “Knowledge” suggest a sense of mystery which only grows as vocalist Nadia E begins her sultry and powerful delivery. The song’s lyrics further the mystery as the verse continues – culminating in the emphatic, “There’s a lot you don’t know about me…” A guitar solo, provided by Jacob Mayeda adds excitement and provides one of the song’s most important dynamic peaks. With the song’s energy continuing to drive right through its final note, “Knowledge” provokes listeners to question what they know while remaining true to Dynamos’ rock ‘n roll sound. The performance music video was filmed in Los Angeles, CA, and features an all-new live recording of “Knowledge”. The band’s chemistry is on full display as audiences far and wide can get a sneak peek into the high-energy and fun Dynamos live show. Each member of the band brings a whole new dimension of musicianship to the video – proving that Dynamos’ own ‘knowledge’ of music sets them apart from emerging bands in the ever-crowded Los Angeles market – and beyond. (Orlando, FL) 1/12/17-Singer-songwriter Ashley J is getting ready to release her title-track “Satisfied” January 26thfrom her upcoming Spring EP. “Satisfied” follows the lead of two incredible singles already released, “Trapped” and “Unbreakable.” With the success of these two singles, being released through her label Bombshell Music, Inc., “Satisfied” is slated to live up to its name. “Satisfied” is a poppy domineering and captivating number that liberates her in an entirely new way. Fitting nicely with her already released singles, it’s another step on her journey of empowerment. Her vocals shine euphorically over a glitch synth pop beat in the breathtaking chorus. The 3-time Billboard charging artist is no stranger to the attention as her most recent single “Unbreakable” charted at #2 and “Trapped” had its incredible 5-week #1 long run on the European Independent Chart. Ashley J. has been cranking out impressive feats as a new independent pop music artist. For Press Inquiries, please contact us through our website!